Background image of A school of shiny mackerel fish swimming. Julie Mack, Healthy Active Schools Coordinator for the Centennial School District, was looking for fish. She needed enough for a district with a student enrollment of 6, 700 and it had to be caught or processed in Oregon. 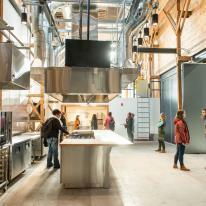 Mack searched the online directory FoodHub, Ecotrust’s network that connects food buyers and sellers. She found Lyf Gildersleeve of Flying Fish Company. Gildersleeve fishmongers from a 176 square foot shack on Southeast Hawthorne in Portland. He set Mack up with an order of cod filet from Astoria. Mack is using a $29,033 grant from the state Department of Education to bring more local foods into school cafeterias to expand food choices and help support local food producers. She presents new, locally-based dishes to the district on Wednesdays through the middle of May. That cod from Astoria featured once last month and will return to the plates again on April 22. Centennial is one of 11 Oregon districts receiving a total of $189,000 in grants through a Farm to School bill passed by the 2011 Legislature. Ecotrust research made the case for that bill. 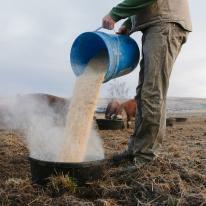 Since 2007, Ecotrust has also been active in connecting schools, farmers, and other producers as the Western Regional Lead agency for the National Farm to School Network. Stacey Sobell, Farm to School Manager for Ecotrust, recently pointed out to OPB’s Ecotrope that grants play a key role in making more local food available to schools, and establishing the connections between all sorts of new producers and large local buyers like schools. Sobell said “center of the plate” protein items are a new focus for schools looking to serve local lunch food, and seafood is gaining traction in a handful of schools nationwide. “This is a big new area that’s really taking off,” she said. 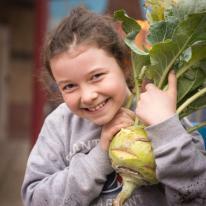 FoodHub and Farm to School are central to Ecotrust’s efforts to build a resilient food system that offers fresh, healthy food to all residents, economically viable food value chains that fairly compensate and respect the dignity of all participants, and methods of food production that renew our resources. Flying Fish Company is the sort of company that forms the heart of that system. 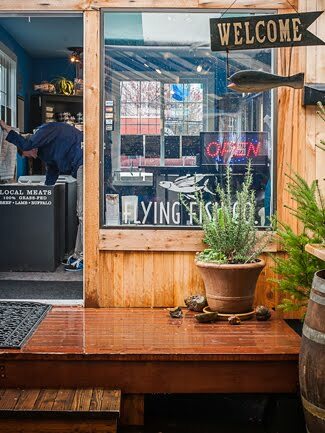 Recently one of four nominees for Edible Portland’s Local Hero Award in the Retailer category, Flying Fish was first opened by Lyf’s father, Craig Gildersleeve, in 1979 in Sandpoint, Idaho. The family business now has branches in Colorado, Utah, and Oregon. 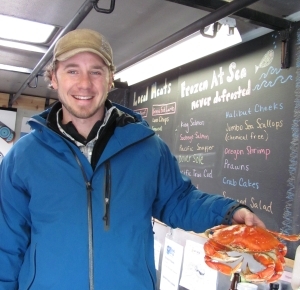 Flying Fish was recently one of four nominees for Edible Portland’s Local Hero Award in the retailer category. Flying Fish’s mission statement reads, “We would never sell anything we wouldn’t serve at our own dinner table.” They’re the kind of small business that can leverage FoodHub’s marketing and networking tools to find buyers like Centennial. 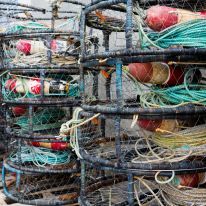 In addition to selling responsibly harvested seafood, including Oregon Dungeness crab and Oregon albacore tuna, the company also offers grassfed meat, including beef, lamb, pork, elk, and bison. Their specialty products range from hand-churned butter to wasabi. To continue stocking the shelves when seasonal products run dry, Flying Fish is now selling products like smoked salmon, sauerkraut, soup, crab and salmon cakes. Gildersleeve said he’ll be looking to FoodHub to help stock that supply chain as well.